Only a third of the world's polar bears may be left within 50 years because of thinning sea ice from global warming in the Arctic. The agency projects that polar bears during that time also will lose 42 percent of the Arctic range they need to live in during summer in the Polar Basin when they need to hunt and breed. Mark Myers, the USGS director, said the findings from U.S. and Canadian scientists are based on six months of new studies, during which the health of three polar bear groups and their dependency on Arctic sea ice were examined using "new and traditional models." Last December, Kempthorne proposed designating as a "threatened" species deserving of federal protection under the Endangered Species Act, because of melting Arctic sea ice from global warming. That category is second to "endangered" on the government's list of species believed most likely to become extinct. 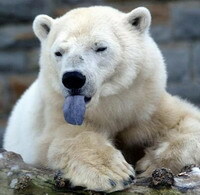 Polar bears depend on sea ice as a platform for hunting seals, which is their primary food. But the sea ice is decreasing throughout their Arctic range due to climate change, the USGS said. A separate organization, the World Conservation Union, based in Gland, Switzerland, has estimated the polar bear population in the Arctic is about 20,000 to 25,000, put at risk by melting sea ice, pollution, hunting, development and even tourism.